One of the technology papers at DySPAN that caught my attention was called "Reconfigurable Wireless Platforms for Spectrally Agile Coexistence" by Rohan Grover, Samuel J. MacMullan, and Alex Wyglinski. Their interest is in providing OFDM waveforms with subcarriers cut out in such a way that the resulting spectrum hole is still deep enough to allow for another radio to use it. Normally, just nulling out subcarriers leaves a lot of power from the side-lobes of the other carriers. So what they suggested instead was the use of IIR filters to provide cheap, sharp notches at these nulled-out subcarriers. The paper explains the development of the IIR filters, in which they have a subset of pre-built and stable filters to meet their performance requirements. They select the a set of filters to use and combine them to provide band notching. Read the paper for more details about what, why, and how. My interest was to see if this scheme would really work and how well. I figured that this would be relatively easy to replicate in GNU Radio, so I went to work. 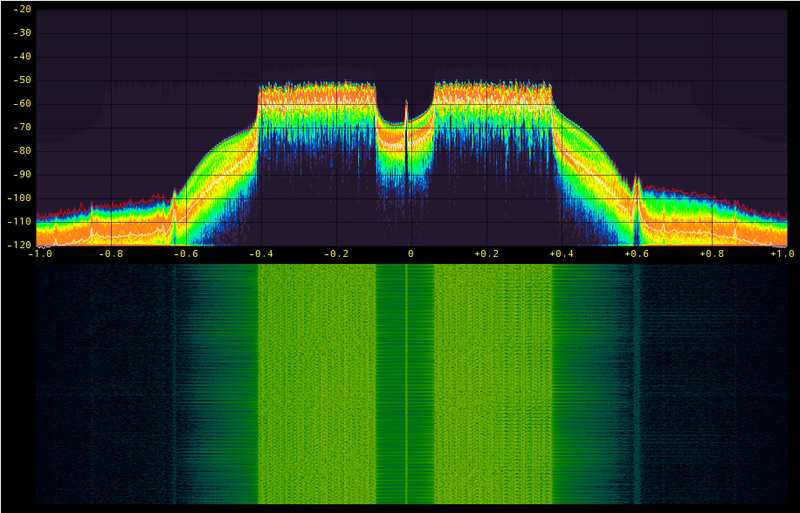 The main problem that I had was that we don't focus on IIR filters in GNU Radio. IIR filters provide too much phase distortion and the lack of SIMD versions of the filters plus the fact that FIR filters are easy to pipeline and implement with FFTs means that we get very good performance and filtering just using FIR filters in software. However, for this, I was going to need an IIR filter that takes complex inputs and outputs, which we didn't have. GNU Radio only had a float in and float out IIR filter. So I went in and fixed this. We now have more IIR filter options for dealing with complex data types and taps. Aside from struggling with C++ templates (because we end up having to specialize pretty much everything), this wasn't that hard to do. 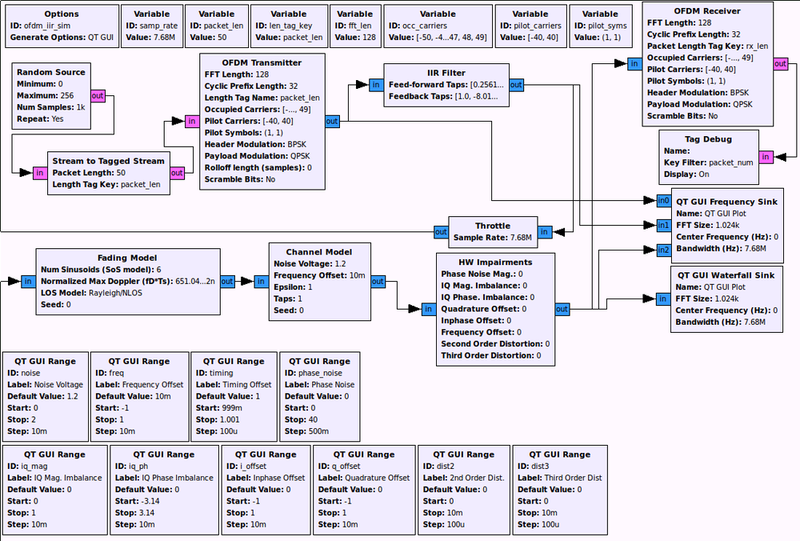 I then put together a simple simulation with our OFDM transmitter and receiver blocks. 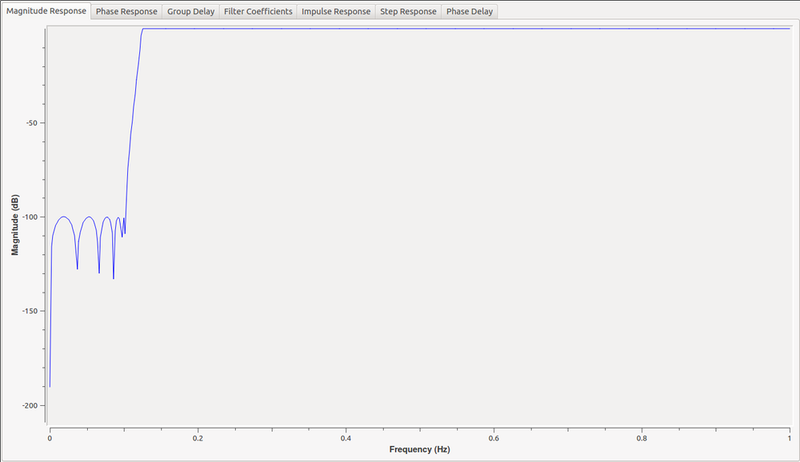 I put the IIR filter on the output of the transmitter and popped open our gr_filter_design tool. The paper doesn't give exact specs for the IIR filters except that they were trying to create a 12-tap filter, but now having the actual specs doesn't exactly matter here. 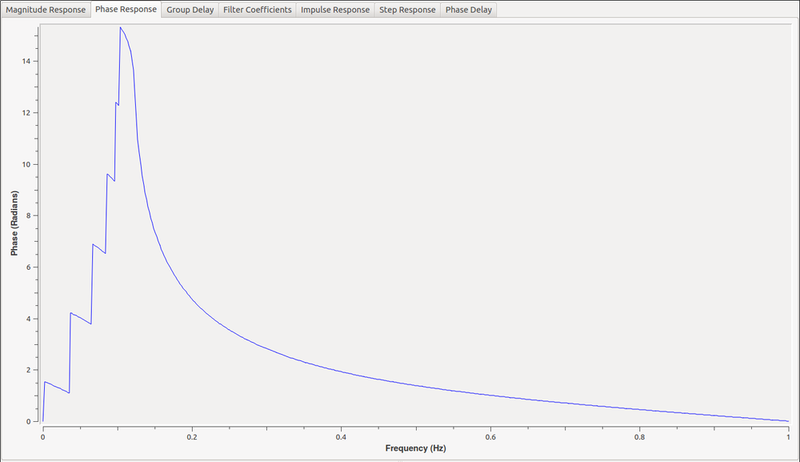 So I designed my filter as an elliptic high pass filter with the end of the stop band at 0.1, the start of the pass band at 0.125, a max loss in the pass band of 0.1 dB, and an out-of-band attenuation of 100 dB. These frequency values are normalized to a sample rate of 1. It was the phase response of the IIR filter that first gave me pause as a way to go about filtering OFDM signals since it would distort the phase of the subcarriers throughout. 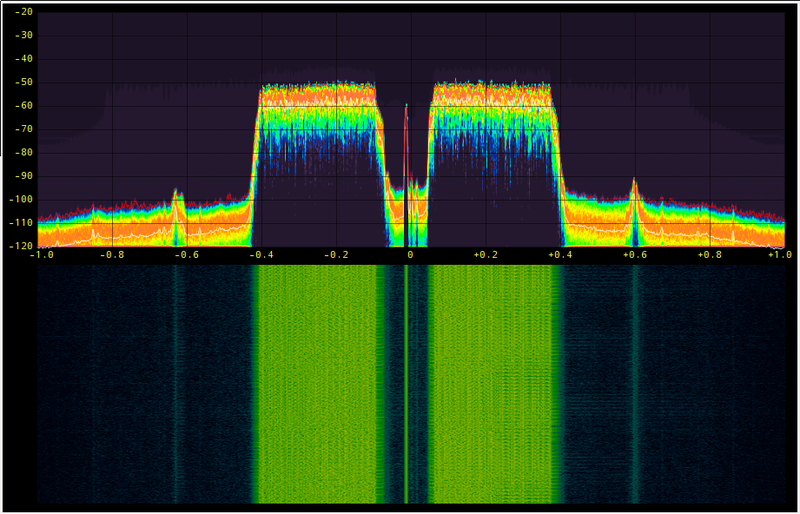 I then realized that the OFDM's equalizer should take care of that, no problem, but I still wanted to test the idea. The paper puts an IIR filter on both the output of the transmitter and the input of the receiver, both to block transmitted signals in that band to minimize the interference caused to other uses as well as to filter out external signals being generated. I just put this on the output of my transmitter to test the basic concept. Here's the flowgraph I used for testing. Notice here that I include a fading model as well as our hardware impairments model. Paul Sutton wanted to know what would happen to the filtered signal once it passed through real radio hardware -- would the IIR filter really still have the same effect? Below is the PSD of the signal at three different stages. 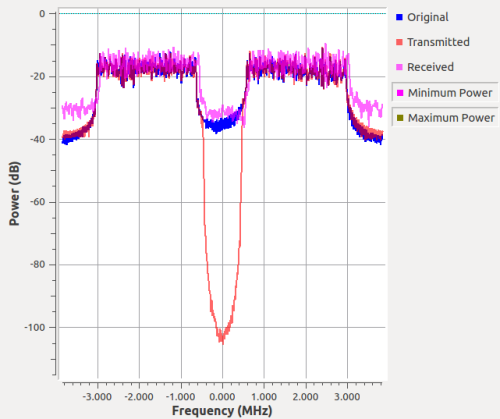 The blue is the output of the original OFDM signal with 128 subcarriers with subcarriers -10 to +10 turned off. 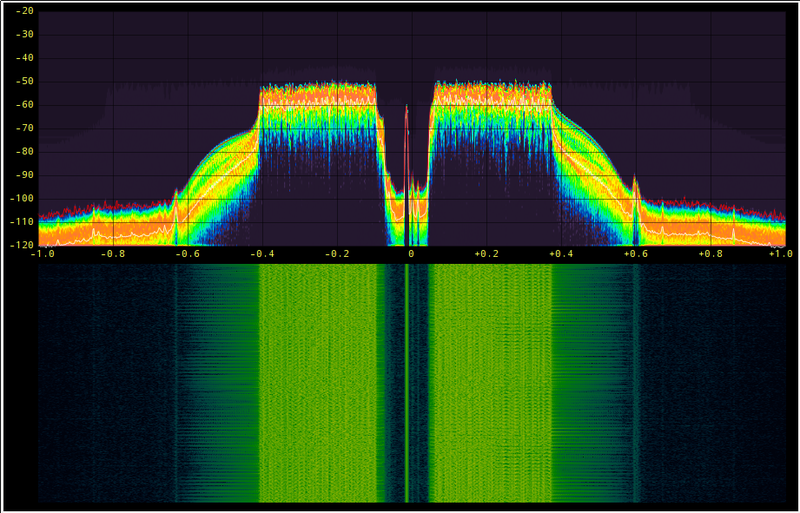 The red line shows the output after the IIR filter, where we can see it notching out those middle 20 subcarriers dramatically. And the magenta is after going through the hardware impairments model doing the minimal amount of signal distortion possible. We can see that even with a near perfect hardware model that the middle subcarriers are no longer as suppressed as they originally were. So that's really our best case scenario when dealing with a real radio. Next, I turned up the IIP3, IIP2, and phase noise distortions just a bit (we'd have to calculate what "a bit" really means for a real hardware system; right now, we just have ratio values to adjust and play with). This brings the out-of-band (OOB) emissions level back up near to the original. But notice that we are still ahead of the game, at least, and our receiver is receiving the packets just fine. I then added the channel model with some noise and a Rayleigh fading model. Here we can see that the noise is dominating in this case, but again, my receiver showed that it was still receiving packets. So conceptually, this is certainly possible and should provide some measure of performance improvement. Given the results shown here, it's not much of a leap to think about the IIR filter being applied to the receiver, which would cause a huge notch in any received signal in those frequencies. So from the point of view of the receiver, we can use this to avoid receiving interference on those subcarriers. With the hardware impairments model, we'd need better translation of the values used to real-world radios. So let's take a look at this with a real radio. I have to say that that is much better than expected. We basically brought the signal down to near the noise floor. We have a DC term that's generated in the receiver, but that's to be expected and wouldn't interfere with another signal as is the purpose of this idea. This was a fun little project, and I was pleased that I could so easily take a paper and reproduce it in GNU Radio to prove the basics. It looks like the idea presented here should provide some good OOB suppression and produce more usable spectrum around otherwise hostile OFDM signals. The use of the hardware impairments model was a nice way to see how different radio problems could affect the concept here, too. Without accounting for these effects, the simulations are not entirely meaningful, and we can then see how much it will take when building a radio to meet the specifications to cancel out effects of the filtering stages. On the other hand, the WBX daughterboard with an Ettus USRP N210 showed great performance with this signal and the added filters. I was able to free up quite a lot of spectrum by filtering at the transmitter using these radios. Perhaps lesser radios wouldn't have behaved so well, but that's for another time.